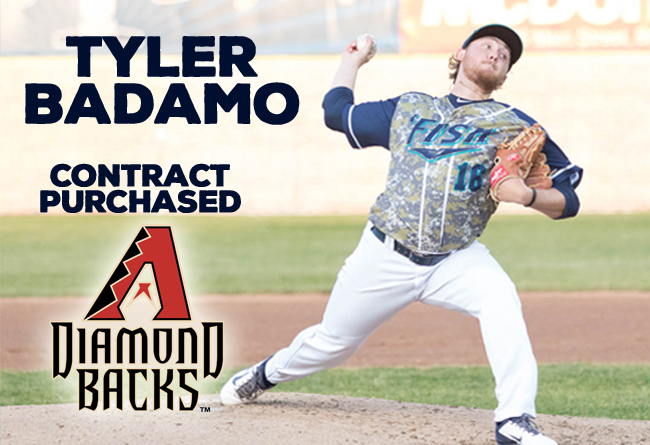 (Bridgeport, Conn., June 30, 2017) – Bridgeport Bluefish team officials have announced that right-handed pitcher Tyler Badamo has had his contract purchased by the Arizona Diamondbacks organization. He will report to Advanced-A Visalia of the California League. Badamo made 11 starts for the ‘Fish this season, earning four victories with a 2.62 ERA and 39 strikeouts across 61.2 innings of work. The 24-year-old made his professional debut in 2014 after being drafted by the New York Mets in the 24th round of the 2014 MLB draft. Before joining the Bluefish, he had spent his entire career with the Mets organization, reaching as high as the Single-A level. Tyler is the third Bluefish player to have his contract purchased during the 2017 season.